Begin your adventure with a journey from the urban setting of Cusco into the Sacred Valley of the Incas, full of lush green fields and surrounded by striking mountain peaks. Explore the beautiful archeological site of Chinchero, where colonial buildings rest atop Inca foundations. Enjoy an astonishing hike through authentic Inca trails from Chinchero to the town of Urquillos. Also, you can go back in time and study the natural Inca salt mines of Maras and the astonishing circular terraces of Moray, believed to be an Inca laboratory dedicated to the study of foreign plant species. Option to visit to the celebrated market at Pisaq or take a moderate hike in the hills and mountains over the Sacred Valley. Later, enjoy exclusive access to the isolated community of Viacha, where you will learn about its artisanal potato farming practices and enjoy a traditional “Pachamanca” meal, cooked under hot stones. After lunch you will visit the archaeological complex at Pisaq, an afternoon excursion that offers a unique opportunity to explore the complex free of crowds, with the sun setting behind the peaks. 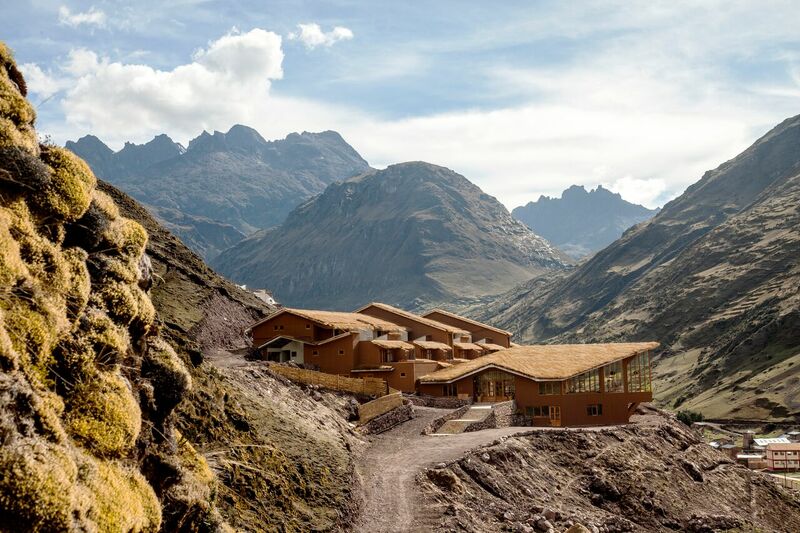 Go deeper into the heart of the Lares region. A road journey into the mountains will take you through remote archaeological sites. After lunch, choose between visiting a traditional weaver’s villager or a scenic drive and a moderate/strenuous hike amidst turquoise blue lakes and towering peaks to the remote village of Huacahuasi. Locals will give you insight into the evolving role of the original Andean people in both the culture and commerce of modern-day Cusco. If you’re in the mood for a relaxing cultural experience today, you can walk through the village of Huacahuasi and learn more about its heritage and daily activities. The expert weavers will share their stories, each depicted in artful textiles full of traditional Inca/Andean symbols and imagery. Then take a cooking class, or just enjoy a walk to a beautiful waterfall near the village. For those who want to go deeper into these remote mountains, challenge yourself with an all-day hike to Quiswarani. Although strenuous, you will be rewarded with amazing views of turquoise lakes and majestic mountains as you travel on well-worn paths edged with wildflowers, passing herds of alpacas and llamas grazing on hillsides as you make your way over steep mountain passes. Spend some time in the morning learning more about the heritage and day-to-day activities of the Huacahuasi community. Then, you can choose to embark on a spectacular hike through varied terrain and over a high pass, to the adjacent valley leading to the ancient town of Ollantaytambo, the oldest living city in Latin America; or try an easygoing hike from Lares Pass- through an astonishing authentic Inca trail- along a beautiful canyon down to the Local Community of Totora. If you prefer to see more of the Sacred Valley, you can drive back for a visit to an ethnographic museum featuring the history of Peru’s rich civilizations of the past or choose to explore the valley on mountain bike. Afterwards, enjoy lunch in the Urubamba River countryside on your way to Ollantaytambo, where you can spend time meandering through its charming maze-like streets. Early morning short hike to Inca storage structures high above Ollantaytambo for magnificent views of the town and the temple. After, enjoy a guided tour of the fortress, one of the best examples of Inca architecture and revel in its mystical history…a perfect introduction to the wonder of Machu Picchu. Midday, embark on a scenic train ride along the Urubamba River to Aguas Calientes, a bustling town below the Machu Picchu Sanctuary. At dawn, begin your visit to Machu Picchu with a rollicking uphill bus ride. As you enter the Sanctuary, the morning sun rises over the iconic Sun Gate and washes the structures and terraces with resplendent light. Prepare to be awed by the skillful architecture of the Watchtower, the Temple of the Sun, and the royal Inca residences, among many others. Take a moment to quietly sit and listen to the wind…or to meditate and absorb the mystical energy that envelops you. Your imagination will soar as you contemplate the history of Machu Picchu and its mysterious origins. Optional uphill hike on Huayna Pichhu. Lunch in Aguas Calientes. Afternoon/Early evening return to Cusco by train and private coach.